How can I stop diarrhea? We have a variety of medications and suggestions to help you with diarrhea. Please call to speak with a healthcare provider if this is a problem. How can I get relief from constipation? We have a variety of medications and suggestions to help you with constipation. Please call to speak with a healthcare provider if this is a problem. Some over the counter medications may interfere with the medications you are being treated with. Check with your doctor before taking any over the counter medications. The prescription medications you are currently taking will be reviewed with your doctor prior to receiving treatment. Not all treatments cause you to lose your hair. Hair loss will be discussed when and if you are going to receive a drug that may cause hair loss. Where can I get a wig? A list of wig resources will be provided to you during your office visit if you are going to be receiving a treatment that causes hair loss. What can I eat before chemotherapy? A light meal before chemotherapy is recommended (avoid alcoholic beverages, fatty, greasy, and spicy foods on the day of treatment). Can I bring my children in the treatment room? It is our policy to not allow children under the age of 18 in the infusion area. What if I get addicted to the pain relievers? Less than 1% become addicted to the pain relievers unless it is being taken for the wrong reasons. Can you refer me to a support group? There are many support groups and other patient resources on our resource page. What happens if my loved one starts vomiting in the middle of the night? There is a doctor on call 24 hours a day, 7 days a week. Simply call the office and you will be connected to our answering service during off hours. The answering service will take you name and number and the doctor on call will call you back. Will I have access to the most up-to date treatments? Yes, we offer the most current treatments and have access to the latest drugs. How will I know what side effects I might get from my chemotherapy treatment? Your doctor will review your treatment initially. Our nurses will provide more information and detail about your treatment and potential side effects. This information will be reinforced throughout your course of treatment. The Interlakes Foundation was created by the Interlakes Oncology and Hematology Physicians in 1996. The Foundation operated as a separate, not-for-profit organization dedicated to improving patient care through research and education. The Foundation participated in over 200 clinical trials and enrolled more than 700 patients to these trials. The affiliation with Wilmot Cancer Institute allows our Physicians to access exciting new clinical trials and offer many of these trials at our community based practice. 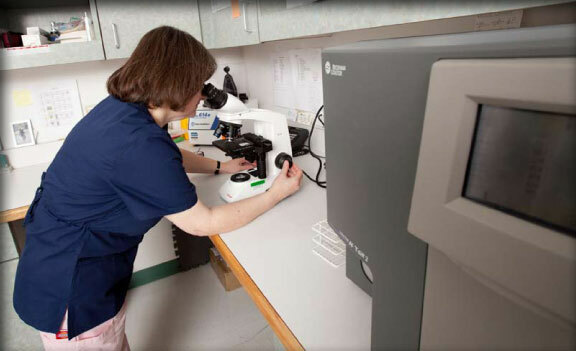 Our patients have embraced the opportunity to participate in studies that offer the most up to date treatments for their disease, treatment for side effects and quality of life issues. Participation in clinical trials may be included in your treatment options. You may also ask your doctor if there is a clinical trial appropriate for you.